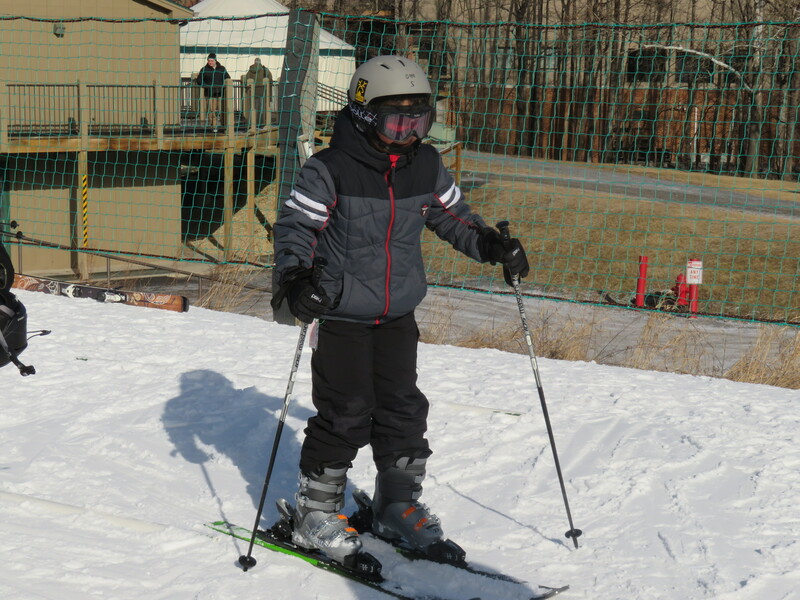 My Cub Scout Pack went skiing at Whitetail Resort in Mercersburg, Pennsylvania on February 03, where we learned and practiced my new winter sport, skiing. We got there before 8:30, early in the morning. When I went there, it was really crowded with a lot of people. The ski boots were really heavy, and so were the skis. After I put on the ski boots, I went outside for my ski lesson. I did well for my lesson because I did not fall at all. After I finished the lesson, I went to practice on the Bunny slope. It was cool for the first time to go up the ski lift, it was really high. The top of the Bunny Slope was amazing! I went down super fast! Unfortunately, I fell a few times going down the slope. But I learned from my mistakes. Then, I was ready for a higher slope. I got tested by Truong Tuan. He is very good with skiing and he taught me a lot of skiing techniques. I ski with Truong Tuan a few times on Bunny Slope and when I did not fall down anymore he went with me to a higher slopes, the Sidewinder and Snow Park. These slopes were humongous and about twice as long as the Bunny Slope. It was an amazing sight! When I skied down the slope, I was really fast! I did not fall at all going down the Sidewinder. I did this slope again a few more times with Truong Tuan’s help, and got really good at it! The Sidewinder was my favorite slope because I struggled with the Snow Park slope. The food at the ski resort was delicious. I ordered curly fries with chicken fingers and a cup of soda for lunch. I got a delicious hot dog with cheese on top and lemonade for dinner. After dinner, I went outside again, and realized it was nighttime. The lights outside and the stars were beautiful. The sky shined with stars. So I grabbed my skis and my ski poles and went skiing again on the Sidewinder slope. Once I was finished skiing, it was time to go home. I returned all the equipment that I rented and went to the car. I left the resort at about 9:00pm. It took about two hours driving from the ski resort to my home, but it was definitely worth it. I can’t wait to go skiing again! Maybe one day I will get to the super high slopes! I love my new awesome winter sport!